We are up in BC's north country, visiting my daughter, her husband and my two grandchildren this week and enjoying the crisp weather and fall colours and a wee bit of snow! I got my October Paper Pumpkin Kit just before we left and I brought it with me so my daughter and I could have some crafting fun together assembling it. But before we got going, I wanted to make my son-in-law a birthday card, and since he is an avid outdoors person who loves hiking and mountain biking, I thought one of the designs in this month's kit would be perfect for him. 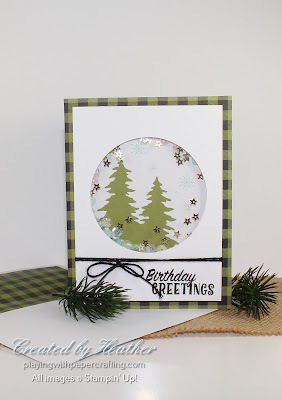 It's very masculine looking anyway, and with the fir trees in side the shaker card, it looks very outdoorsy! The only modifications I made were to add a birthday greeting on the front. I choose one from Birthday Delivery stamp set with Basic Black Archival Ink. Because the cardstock from the kit has a stitching texture to it, it was hard to get even coverage of the letters. I ended up filling them in with a Stampin' Write Marker. I added some Basic Black Solid Baker's Twine around the card front between the shaker part and above the sentiment. If Kris and I get the rest put together in time, I'll add the rest of the photos. If not, I'll share them at a later time! I hope you have your subscription! So much fun to have that little surprise package arrive once a month, right to your doorstep! This fall, the October and November Paper Pumpkin kits are coordinated to help you with your Holiday Season tasks such as greeting cards and gift giving. Even if you've missed the October kit, you can subscribe before November 10th and get the November kit. Once you are a subscriber, you may then be able to back order an October kit and not miss out! Just go to PaperPumpkin.com and click on subscribe! It's a great deal!